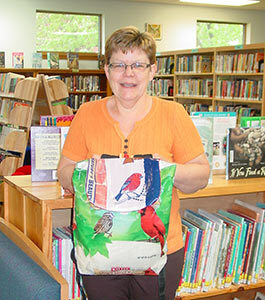 Bird Watching Backpacks are now in local libraries - ready to be checked out. CBC donated the backpacks to encourage families to enjoy the outdoors and learn about the birds in our neighborhood. Chequamegon Bird Club members are an active lot. From time to time, we'll be describing and showing some of the activities in which various members are involved. 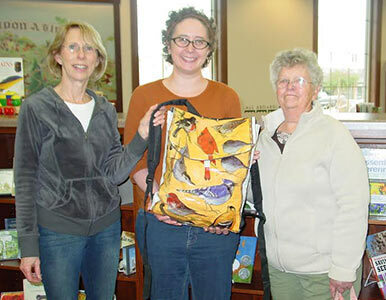 A Birding Backpack was donated to Westboro Public Library by the Chequamegon Bird Club. 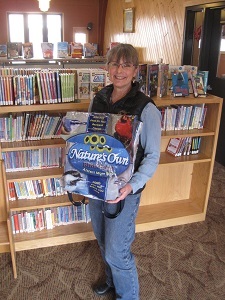 That makes the 7th Birding Backpack donated to local libraries for families to check out. 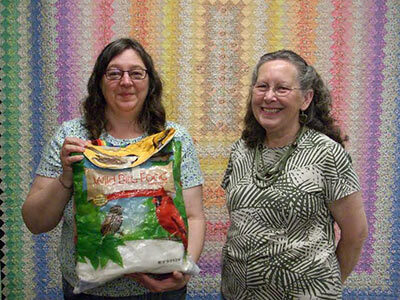 The colorful outer pack was made by our member, Norma Smoje, from recycled bird seed bags. Inside there are youth binoculars and adult binoculars, a field guide for the adult to help identify birds, "Wild About Wisconsin Birds - a Youth's Guide to Birds of Wisconsin", a folder of helpful information and a backpack to use in the field. The libraries that now have the backpacks ready for check-out are Westboro Public Library, Rib Lake Public Library, Western Taylor County Library in Gilman, Francis L. Simek Memorial Library in Medford, Dorchester Public Library, Abbotsford Public Library and Colby Public Library. As funds become available the CBC hopes to add birding backpacks to additional libraries. 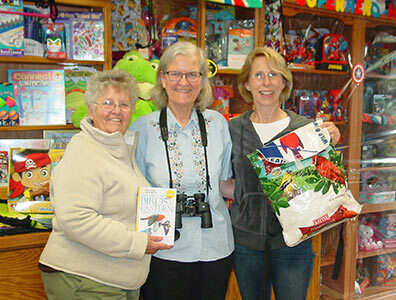 A special "Thanks" to Wild Birds Unlimited in Wausau and Boswell Books in Milwaukee for giving us special pricing on some of the binoculars and books. Backpack items on display at Francis L. Simek Memorial Library in Medford. 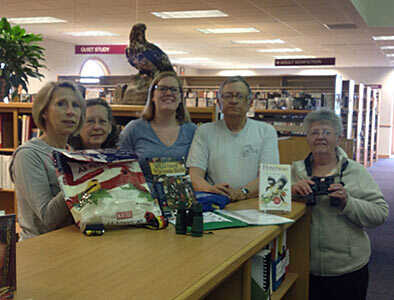 CBC members Judy Derrico, Cam Scott, Library Director Anne LaRoche, Ron Shiffler, and Norma Smoje. The Chequamegon Bird Club, with funding from the USDA Forest Service, has created a pocket-sized brochure listing some of the best birding locations in North Central Wisconsin. It includes locations and access information, likely species, birding tips and other features of each area. Currently the brochure is available through the Forest Service Office in Medford or the Gilman Village Clerk's office. You can also print a copy of the PDF version here. We are experimenting with an on-line bird identification quiz. Test your bird ID skills with the CBC Bird Identification Quiz. At each monthly meeting Chequamegon Bird Club members share observations of the birds they have seen within the Wisconsin borders since the last meeting. Note: Any CBC members who weren't able to pick up the official Field Check List (handed out at the monthly meetings) for making your monthly bird sightings observations can print out a copy here or the Bird Source version of it here. Each fall the C.B.C. holds an annual banquet with a guest speaker. Watch this section for details of the upcoming banquet.